We, Holy Cross Home Care and Hospice, serve together in the spirit of the Gospel as a compassionate and transforming healing presence within our communities. Holy Cross Hospice's community-based services emphasize the importance of maintaining patients in their home environment, whether in their home, assisted living facility, a group home or a nursing home. We serve patients in Montgomery, Prince George's and Howard Counties. Skilled Nursing: Registered nurses and licensed practical nurses assess, evaluate and provide care to patients with a variety of conditions. Social Work: Medical social workers provide planning, counseling and support for patients and families to help them deal with social, emotional, financial and practical issues. Personal Assistance: Certified nursing assistants provide assistance with daily activities. Spiritual Support: Spiritual Care representatives provide end-of-life spiritual support to the patient and families of all religious affiliations. General Support: Volunteers work with the team to provide practical assistance, respite and support to patients and families. Bereavement Support: Grief counseling for adults and children is available to those who've lost a loved one in our Hospice program. 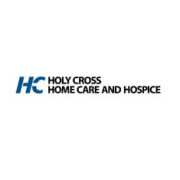 Would you recommend Holy Cross Home Care and Hospice?